My initial deep sigh became a long moan of relief as the tiny muscles across my scalp began pulsating and throbbing. This was the onset of the longed-for cascade of sensations as my folded legs sunk into the too-hot bath water. It had been a punishingly-long riding day on our 9th day of the cycling season. Bill predicted a modest 20 miles with an accumulation of about 1000' in elevation gain. Instead, the longer than expected distance on the one-lane back roads dished-out 3500' of gain. The temperatures that had been in the 60's for weeks popped into the mid to high 80's, making overheating an additional, unexpected challenge while climbing well beyond our conditioning edge. Looking back at 1 of several climbs on the unexpectedly long day. My legs were pooped and my deeply fatigued upper body muscles had struggled to hold my bike steady during the last couple of miles into Cetinje, our destination for the night. Finishing the long day in heavy, fast traffic on the main road that like so many other roads that day, was tilted up, had meant stopping every several hundred yards to let the faltering big muscles recover enough to press-on. But after the bikes were tucked away for the night and the power muscles happily went off-duty, it was the tiny stabilizing muscles around my head that refused to let go. It was the combination of the suddenly warmer temperatures on an "Alps day" of climbing that was still registering in my jaw, neck, and scalp. My leg muscles had done their job by rhythmically pumping, by alternately contracting and releasing thousands of times throughout the day. Instead of providing power, my upper body muscles provided stability: they kept the front wheel tracking straight regardless of the rocking created by my legs or erratic swings caused by the wind or uneven road surfaces. Like my legs, my arms and shoulders could tell when the work was over, they could stop producing when separated from the bike. But it was those upper, upper-body muscles around my head that had been in a near continuous isometric contraction all day that didn't hear the bell, that missed the signal "We're done." Instead of letting go, they kept on working, they kept on gripping, they kept fighting against forces that were no longer there. some Cetinje museum 'eye candy'. Getting those little stabilizing muscles that subtly aid in one's balance to shut down after an unusually hard or hot day is one of my special challenges as a cyclist. But I've learned that nothing signals those guys to relax like hot water, either in the form of a powerful stream from a robust shower head or from immersing myself in too-hot water. Both of those hot water sources of relief can be hard to come by when we travel and I couldn't believe my good fortune in having a tub this night in a region were tiny water tanks were the norm and the usual flimsy shower heads wouldn't trigger the muscle release I needed. I'd mentioned to Bill towards the end of our riding day that I longed for a tub in which to soak and 1 of the 2 rooms he was shown at our destination had a tub. As I knew they would, my head muscles started to shift out their reactive loop as soon as my legs hit the smoking hot water. Curiously, it doesn't take submerging my head to get their attention as even sitting in the hot water triggers a relaxation response that ripples through my core up to my crown. It wouldn't be until the next morning that the discomfort wrapping my head would completely dissipate but I was reassured by knowing that the process had begun as soon as I hit the water. Montenegro's central region was consistently delivering difficult riding just like the coastal roads had done before. In both areas we couldn't ride far without accumulating a lot of fatiguing elevation gain. The poor quality map added to the challenges in both areas as the distances marked weren't accurate and the usual symbols for grade were missing. But now that we were away from the coast Bill was having more success in finding the less-traveled roads...until arriving in Cetinje. Our tour of Montenegro's interior was to begin by heading inland to this old royal capital, Cetinje. 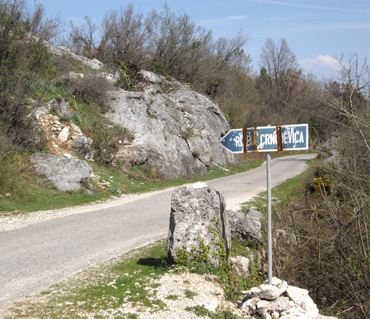 But once in Cetinje, we discovered that the traffic on the main road that we would be traveling to reach deeper into the interior was so terrible that we abandoned the route and returned to Kotor from Cetinje. From Kotor we would continue south to finish our tour of the coast. Almost 3 weeks later and after I had completed "Phase 1" of my shoulder injury recovery, we resumed our exploration of the interior with the help of a train which catapulted us past the worst of the traffic. My first loaded riding day with my "new" shoulder, "newly injured" that is, was a success. It didn't complain much, even after the unexpected jerk when my bike dumped over (when I was off of it) on our way from the coastal town of Ulcinj to Bar. My body was generally happier with the effort than with the test ride 2 days before, a day in which I was able to shed almost all of my apprehension about riding again. And the traffic and weather were both better than expected, making a nice finale to our tour of coastal Montenegro. We then topped-off the day with a three and a half hour train trip from Bar into Montenegro's interior to Mojkovac--a train ride that would spare us days of truck-route traffic on the main international highway heading to Serbia. Bill was right--our $20 rail event (for 2) from Bar to Mojkovac was a far better entertainment value than the "scenic" TranzAlpine train ride across New Zealand that was many times the price. Much of Montenegro's interior is a high plateau, some of which has been cut by water to form deep canyons on the scale of the Grand Canyon. However the local gray limestone didn't produce a colorful show like in the Grand Canyon. But the physical erosion caused by the water on the Montenegrin karst was augmented by the chemical effect of carbon dioxide dissolved in the water and together the actions resulted in dramatic, deep cuts in the rock. The views of the mountains and the river from the train were stunning. Much of the train route is at higher elevations than the road, making the train route even more spectacular than it would have seemed from a bike or car. But in the last hour of the metal-wheel ride our attention turned from admiring the natural beauty to wondering what we were getting ourselves into. The train kept stopping at places where there was nothing. It seemed that there were no roads and no infrastructure at these stops besides a small railroad office building with a single, almost motionless, staff person. The sun was low and we started feeling like we were entering the "Twilight Zone." There were small settlements and homesteads off in the distance and at lower elevations but the train line itself was feeling too remote, too isolated. We both wondered what we'd do if our stop was at one of those blank places on the tracks: would we get off the train as planned or panic and stay on board until the last stop? Fortunately by the time the sun was setting the train tracks eased themselves down to the elevation of the river, down close to the road, which boded well for a real community being at their intersection. The smiling but non-verbal conductor appeared at our car door and indicated that our stop would be soon. He and another passenger assisted us, making sure we wasted no time in pouring our panniers and bikes out of the small, high doorway of the ancient train car onto the narrow concrete platform. The train roared away in the dim light before we'd even finished our bag count. This was one of the rare times when we ride at night. Fortunately it wasn't far to the center of town, perhaps a mile or so, but it was made more difficult by not being able to actually find the center. We rode back and forth on the dusty paved roads with the aid of our small headlights and a few street lights trying to find our hotel. The ski-jump-shaped hotel on the edge of town was easy to spot, but it took asking several times to get correct directions to our home for the night. Our Mojkovac hotel overlooked the "hot spot" settling pond. Despite our apprehension on the train and our difficulty finding our hotel, things were better than indicated in our guide book. "Montenegro under construction" was working in our favor this time. The little train station that our guide book described as looking like it had been shelled by NATO had a fresh and welcoming exterior. Our 7 room hotel that was described as utilitarian seemed newly renovated and welcoming to us. The next morning we noticed that the view out of our hotel's floor-to-ceiling cafe windows was on to a lake--sort of. It looked more like a gravel pit to me. Bill resolved the contradiction from what our Lonely Planet guide book said: it had been a lake--a lake of unknown years of accumulated toxic waste from mining operations right on the banks of the mighty Tara River. The UN and the Czech government were cleaning-up the toxic waste site and that was what was making it look like a gravel pit. It was a jarring finding in a town that Bill had selected because it was a gateway to 2 of Montenegro's 3 national parks. The smell & sight of creosote was common in Montenegro. "Montenegro is under construction;" "Montenegro is re-inventing itself;" "Montenegro is rapidly evolving" were slogan's I kept trying out to match my experience of Montenegro--one that was a better fit than "Experience wild beauty" that was used on the international TV ads. Bill felt no need for spin: "Montenegro hasn't been out of the Middle Ages long. "; "How are they ever going to make it?" were his spontaneous comments. 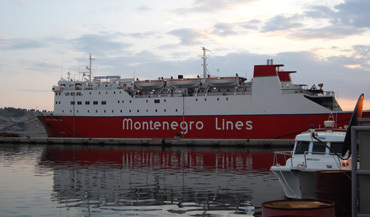 Since arriving in Montenegro, looking closely at it always left me in distress. Clearly they needed a lot of help and the signs posted around the country acknowledging developmental aid from the EU, the US, Germany, Italy, Czech, and all the rest said they were getting it. And yet, it was hard not to be distressed. Finding myself saying "Creosote, I haven't smelled creosote in decades" only heightened my disquiet. Outlawed in the US in my time as being too, too toxic, as being carcinogenic, creosote was vaporizing on freshly coated poles along the roads we walked and cycled. 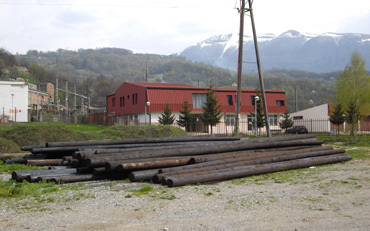 Probably within a mile radius of the toxic lake clean-up in Mojkovac we saw 2 stacks of creosoted poles; outhouses balanced so as to discharge into the stream above the lake; and water channels lined with garbage. An outhouse strategically poised over the creek. Human waste isn't usually as toxic as what was oozing out of the lake, but still, it seemed like a hopeless case of "not getting it" in Mojkovac. And after all, Mojkovac was upstream from the national park wrapped around the Tara River. Clearing our nostrils with vaporizing creosote and seeing the outhouses poised over the creek on the edge of town as we finished our hike did clarify one thing--we'd drink bottled water while in Mojkovac. Bottled water is a wild card, coming from an unknown source and unknown conditions. But the ground we were walking on was surely steeped in both organic and inorganic contaminants and given this was the state of affairs at 2,600' elevation, it was hard to have confidence that the local water would be pure even if it came from higher up. "Pieced together" was a descriptor that rolled through my mind as we walked on a road posted as a hiking trail in the hills above Mojkovac. In seemed that homes, that lives, were pieced together with the scraps that could be found. The siding and roofs on many homes in this cold and snowy region were montages of corrugated fiberglass panels, corrugated metal, and sheet metal scraps over wood. "Pieced together" became a new candidate slogan for my Montenegro experience. It wasn't hard to understand the images that triggered Bill's comment "Montenegro hasn't been out of the Middle Ages long" as life for a segment of Mojkovac's population looked hard and basic. The original DIY (do it yourself) was on show here, but not the slick, big-box DIY of more western retail chains but that of life a few notches above subsistence living. Here the locals were milling their own wood in their front yard even though there were a couple of saw mills in town; concrete brick making seemed to be a cottage industry; and the neighborhood auto mechanic's shop was literally in the road. I admire self-sufficiency and ingenuity but the need for it helped explain why caring for the environment was a low priority on the list of too many challenges for a portion of Mojkovac's 4,200 residents. 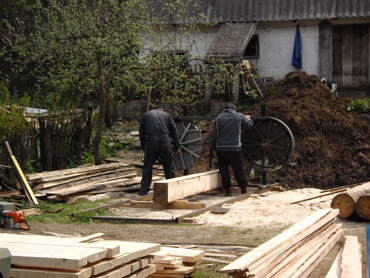 A front-yard milling operation in Mojkovac. I always press for reconciliation of the conflicts in my mind when presented with unsettling sights like those at Mojkovac and Ulcinj before that. "Is it me? Is it them? Am I judging others by an arrogant, elitist standard? Is there something fundamentally wrong here? What don't I understand?" are the questions that typically whirl through my mind. Rather than do the Mediterranean shoulder shrug and head tilt with raised open palms and then let the conflict drop-away unresolved, I struggled to understand what we were witnessing. In Mojkovac my personal process of reconciliation was accelerated both by kicking around my observations with Bill and by doing a little online research. Bill's break-through contribution began with the hypothesis that in Mojkovac we were seeing a highly visible example of the current developmental stage of the country's larger economy--that of an economy transitioning from primary being a rural economy to primarily being an urban one. Currently more than 50% of Montenegro's population lives in communities of less than 10,000. Bijelo Polje, one of our upcoming overnight stops, qualified as the 4th largest city in the country with its 16,000 people. This transitional phase in economic developmental of moving from a primarily rural to a primarily urban economy is the same process that is currently underway in China. Of course in China the transition is occurring on a much larger scale. It is this process that is in part fueling China's tremendous growth and no doubt Montenegro is hoping to fuel its growth with the same rural-urban transition. 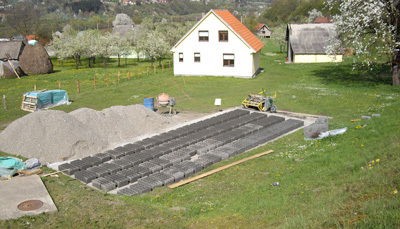 Cottage-industry concrete brick making in Mojkovac's 'burbs. With that perspective, we could imagine that the low standard of living--the near-subsistence lifestyle we were seeing on one of Mojkovac's roads--was probably the predominate way of life for most people in the Balkan Peninsula until sometime into the 20th century. We were witnessing a bit of dying European history--a rural-based economy--not some local aberration or pocket of poverty. And it was the Montenegrin government's pushing hard on tourism that had us being tourists in such a transitional region--not the developmental stage that is the usual backdrop for travelers. These discussions about Mojkovac and Montenegro had us thinking back to the DVD economics lectures we watched lasted year. In them the professor said that the most effective way to enhance the quality of life for the poorest of a country's people wasn't by funding programs aimed at the poor but instead to rev-up the whole economy. Energizing the economy would create more for everybody and would give the poor a bigger boost than direct aid. I realized that too was probably part of the strategy of the Montenegrin government; that they were striving to catapult the country's economy by energizing the tourism industry. Getting more money into the country would generate the funds needed to improve the entire country's infrastructure and to get running water into some of the mountain villages. In pondering what we were seeing in Mojkovac, I realized that my model for tourism was that of a good hostess: first you tidy things up, then you invite the guests. That certainly is the formula in the US and in western Europe and even in coastal Croatia. Nice pedestrian promenades, charming city centers, and thoughtfully developed national parks draw the tourists and make them feel good. Part of my discomfort in Montenegro seemingly was because it was following a different model: build beach resorts to bring in the money, then finance other tourist destinations in the mountains while simultaneously promoting them. With Bill's input, changing the economic model I was using to judge Montenegro, especially the interior, resolved much of my conflict about what I was seeing. However some online research only hardened my shock at the environmental chaos we were witnessing. 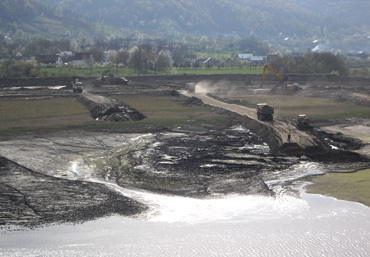 Online I read bits of UN reports about the clean-up of Mojkovac's "lake," or "sludge settling lagoon," as they referred to it. We'd romanticized that it was a settling pond but one begun by the Roman silver mining operations. I found no reference to the Romans or to silver but instead was left with the duller story of lead and zinc mining operations that abruptly ceased in 1991 (no doubt with the dismantling of the political structure in eastern Europe). It also became clear that Mojkovac was lucky in that their toxic brew was on the banks of the Tara River, a river that is part of the enormous Danube catchment area. Being poised to poison not just themselves but also their well-to-do neighbors raised Mojkovac's "hot spot" status, qualifying it for more immediate international assistance. Reading those online details made us feel wise for deciding to buy bottled drinking water. But as I read on, my disgust with the local population's careless disregard for the environment was intensified. 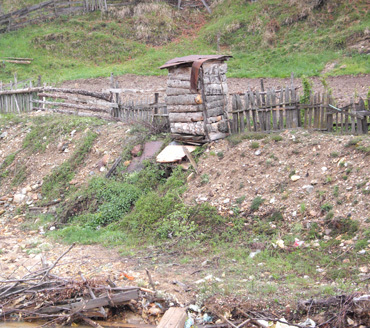 In some ways our shock at the outhouses discharging into the stream uphill from the lake and the Tara River was prudish as according to the UN report, the municipality systematically discharged its sewage into the lake, I mean lagoon, in the summer months. Egads! That over-the-edge approach to garbage. The UN report went further, in very politically-correct and controlled language, about the need to heighten the sense of environmental stewardship within the local community. 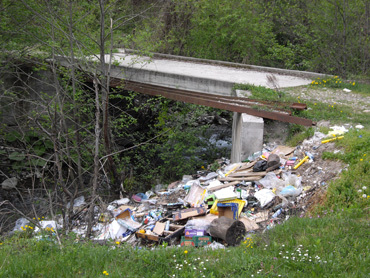 All I could think when reading about the need for stewardship was that the person writing the report actually walked where we had walked in Mojkovac and had no doubt witnessed the outhouses over the creeks and destructive habits like dumping garbage "over the edge," over the edge of anything. It seemed that the regional notion was that there was some purifying quality when your debris passes over the edge of a cliff, a bank, or a road. Even at the hillside cemeteries the wrappings from flowers and entire tattered plastic flower arrangements were pitched over the edge of the cemetery, which usually meant it was on its way down to the road, which was why we saw it. Later we learned that Montenegro's 2006 constitution declared the country the world's first "ecological state." I'm not sure what that means but it clearly was a lofty ideal put forth by those at the top and not a grassroots initiative from people living in places like Mojkovac. What we'd seen on the coast and so far in the interior suggested that the Montenegrin government had an uphill battle in educating its people about the very basics of environmental care, like there is no "away" when you throw something "away." "The Balkans as They Once Were"
Having the TV advertising slogans for Croatia and Montenegro, "The Mediterranean as it once was" and "Experience wild beauty" respectively, looping around in our heads for years, seemed to compel me to come up with a more accurate slogan for Montenegro. When in the interior "The Balkans as they once were" seemed like the best fit, though it closely mimicked Croatia's line. Mojkovac, Bijelo Polje, and then Berane had our eyes bulging and our mouths hanging open. Mojkovac was tiny and we were quite distracted by the environmental issues there, but the "B" towns were bustling with eastern energy that still amazes us every time we see and feel it. Freestanding retail kiosks were part of the eastern-European look. The blend of Slavic culture with Near East traditions that seems to typify the Balkans hadn't lost its power to stop us in our tracks. When we came into the "B" towns we literally halted in the street to take in all in. It was lunch time when we arrived in Bijelo Polje so we strategically positioned ourselves on the edge of a small park so as to politely stare at the scene while we ate, though we couldn't avoid also being the subject of stares ourselves. It's a hard difference to capture in a photo and I can do little better with words but the look on the sidewalks is that of a different world. Even in a small town, the retail is all crammed together in a series of tiny, one storey shops. I always imagine that the ancestral memory of the owners is struggling to recreate the warren quality of the Medina's, the covered bazaars. But the pinched and compacted shops look odd out in the open air. The eastern European spin adds peculiar, brightly colored, free-standing kiosks into the mix, booths that are never quite level on the ground. A welcome, rare directional sign on a secondary road. With the exception of a bit of an upset triggered by the small groups of men in the coastal region around Tivat--men who looked habituated to taking a bullying stance--we felt very at ease around the Montenegrins in each region we visited. Collectively, they seemed more confident and at peace than their northern neighbors the Croatians and lacked the war-weary look of the Serbians with whom they broke away from in the last couple of years. Laid-back, at ease, contented, not in a hurry (except behind the wheel), they were an easy people to be around. On a very narrow, unsigned, 1 lane road Bill flagged down a half-dozen drivers to confirm we were still on course as we never once saw a sign to our destination, Cetinje, over the 25 miles. Every driver immediately stopped to indicate that we were indeed heading the the right direction. Only a couple of the drivers probably spoke English but none were reluctant to engage us. Once in Cetinje we had a couple of problems related to our unstaffed pension and people that we asked to make a phone call or translate in our behalf didn't hesitate for a moment. We still got lots of stares as we did everywhere in Montenegro but we felt welcome and supported as "other." In the overnight stop before Cetinje at the speck of a village of Virpazar, our bikes were deposited outside the tiny hotel by the staff in the morning for the ritual floor mopping. At first I was horrified as they are never left unattended on the streets, especially without being locked. But after a moment more of consideration I realized that everyone in the village surely knew who owned those 2 bikes and the dozens of people sitting, milling, or looking into the central area surely constituted an iron-clad neighborhood watch. We felt confident that should someone mess with our bikes that these locals would advocate for the strangers rather than watch to see what happened as might be the case elsewhere. 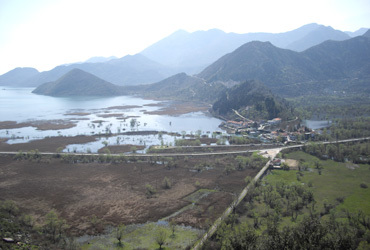 Looking down on the village & lake of Virpazar. 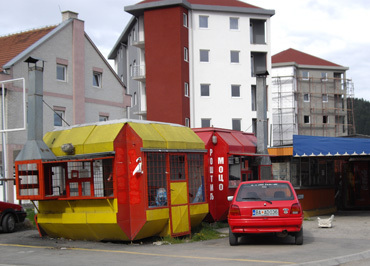 Curiously, in the interior around the "B towns" of Bijelo Polje and Berane, the affect of the people markedly changed. Suddenly, people were quite friendly, outgoingly friendly. As I had walked and walked the streets of coastal Ulcinj for 2 weeks I finally decided I was culturally inappropriate in greeting strangers I encountered with "Doberdan" or "Hello." There it was clearly more appropriate to treat others as though they were invisible, aside for sharing space on the sidewalks. Seemingly greetings were only exchanged between acquaintances in Ulcinj. But all that changed in this pocket around Bijelo Polje and Berane. People greeted us; a trio of college women presented themselves for a conversation while we ate lunch; college-aged males in cars honked and waved until we waved back; people spontaneously stopped to offer directional help; oncoming cars on the road would give us a toot and wave; and people chatting with us would put a hand on our arm. It was a dramatic change in social decorum that didn't coincide with the changing ethnic or religious mix as best I could determine. We had no explanation for the difference in sociability but are quite certain it was a regional difference and not a difference in what we were doing. 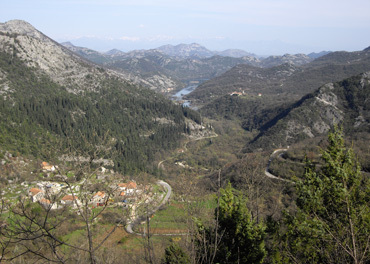 One of the grand panoramas in Morača Canyon. Our looping route within Montenegro's interior had brought us close to the borders with Serbia and Albania, which probably accounted for some of the cultural shifts from town to town. But Kolašin, our last major stop in the mountains, is one of Montenegro's ski resort towns and predictably, it had a more western European feel to it. 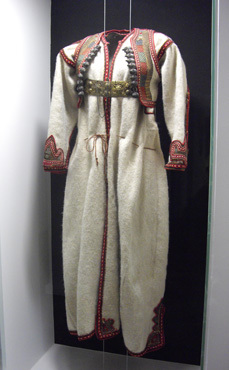 The Near East and Slavic traditions weren't a part of the street scene and the outdoor sports energy predominated. From Kolašin we headed generally west back into central Montenegro to the modern capital of Podgorica. Nudged by a Kolašin host who promised a 100% downhill ride through the scenic Morača Canyon, we embarked on the 70 km (45 miles) ride. Of course, it wasn't all downhill, but enough so that we could enjoy the day despite 1 long, terrifying tunnel. This busy, narrow, unlit tunnel with a drainage ditch along the narrow pavement track was far too dangerous to ride so we pushed our bikes through it wearing all of our reflective materials and every flashing light we had. We only made the ride because it fell on a Sunday and surprisingly, that only diminished the truck traffic until about noon. 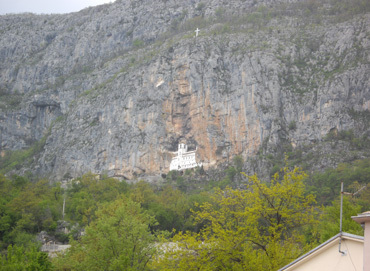 Getting to the Ostrog Monastery was interesting in itself. From Podgorica we made a day trip without bikes to the much touted Ostrog Monastery. The Monastery turned out to be one of those places that is more intriguing on the postcards than in person. It is an important pilgrimage destination for Orthodox and Catholic Christians, as well as Muslims, because of the saint who founded it but didn't offer much to tourists. While we munched our lunch on the edge of the Monastery parking lot, we were entertained by a bunch of Ukrainians pouring out of, and then back into, several large vans as a part of their visit the religious site. They looked like folks who probably lived very simple lives and it was easy to imagine that they had bought their cameras just for this trip. As it turned out, our visit to the Monastery was more interesting for the challenges in getting there and watching the other visitors than seeing it ourselves. The train we boarded with the bikes at Podgorica delivered us as planned in the port city of Bar, making it our 3rd and last time through Bar for the season. From there it was an overnight ferry to Bari, Italy where we'd welcome being back in thoroughly western Europe. We'd have only a week to make our way to Pisa on the opposite coast so as to catch a flight for a 10 day visit to Malta without the bikes. Our overnight ferry to Italy still had its 1970's interior. We will forever be pleased that we persevered and made a second attempt at visiting Montenegro's interior after being deterred by traffic in our first attempt from Cetinje. Taking the train into the interior from Bar worked like a charm and once there, Bill was able to keep us away from the young men who drove as though transfixed in a video game most of the time. As expected, the interior gave us a very different sense of the land and the people. The interior hasn't been cranked up to be a cash cow as seems to be the goal along the coast, which made it more comfortable for us. And the interior was much greener and much more mountainous than the interior of the Balkan Peninsula that we'd seen in Croatia and Serbia, which was a surprise. But like the coast, the mountainous interior was nice, not grand. Careful reading of our guide book along the way firmed our belief that Lonely Planet authors write like every country is a 5-star destination, then rank the sights over the full range. At best, we'd rank Montenegro as a 3-star destination, with Kotor and Kotor Bay likely being the only sights to win all 3 stars. For Americans, Montenegro is definitely too far away and either too difficult or too expensive to get to for us to recommend it. I kept saying to Bill "Maybe we could recommend it for someone on their way to...." but to where, Albania? We did encounter a solo and a pair of long-distance cyclists in Montenegro that were going through the country on their way back from Egypt and India respectively, but these aren't your ordinary travelers. And then there was the pair of men on bikes who had started in Macedonia as one completed his tour in the Peace Corps--again, not your average travelers. But none of these folks were lingering to see Montenegro, instead the country just happened to be on the the fastest route they could plot to get through the Peninsula to more sought-after destinations. So for us, Montenegro goes on the list entitled "Glad to have seen it, don't need to go back anytime soon." Our extended visit did de-mystify Montenegro and added to our deeper understanding of the region and the world, and for that we are grateful to have had the experience. We are in Italy--just barely. We've been back-and-forth between Italy and France as we've gone up-and-down the Alps and to-and-from the Alps and the coast. Almost 2 weeks ago we did a monstrous climb up the Col d'Turini in France only to have a tooth break and an inlay fall out after dinner. The next morning we flew down the mountain until we could hop a train into Menton, France. By dinner time that evening a sympathetic, non-English-speaking dentist had finished taking an impression for my new inlay. 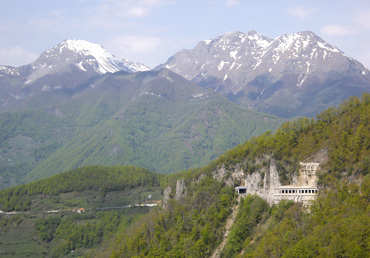 We return to Menton this Wednesday after 2 weeks of big-climbs in these Maritime and High Alps to have my inlay seated. Bill has been working overtime doing route planning so we don't miss a day of riding despite needing to use the train to speed our access to and from Menton. Doing a 2 week "dental care" loop has of course ruined Map Man's original route to get us to the Dolomites in time for our 4th of July apartment reservation. But he has been burning the midnight oil to continue mixing train travel with cycling so as not to lose our training edge that allows us to do the steep climbs up the high passes without shredding our knees. One way or another we'll arrive in Selva di Gardena on July 4th for our hiking interlude. Things are looking up: I get my tooth repaired on Wednesday and last night was the first night in 10 weeks that I wasn't awakened with shoulder injury related pain--yippy!